When I think of New Year’s Eve, I think, “I hope I can stay awake long enough to see the ball drop this year!” Am I right, or am I right??! 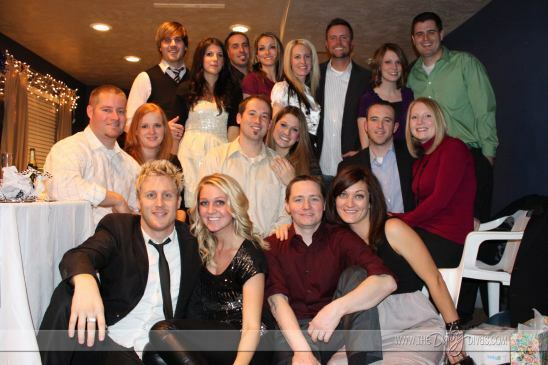 Ten years ago I would’ve been trying to decide which New Year’s party to attend. Here I am, five kids later and I’ve noticed that it’s getting harder and harder to remember New Year’s Eve. Much less, ring in the New Year at midnight. If you’re anything like me, then 10PM is the new midnight! When ten o’clock strikes, we run to the porch to rat-ta-tat-tat on pans, while screaming at the top of our lungs for the world to hear! Sorry neighbors, I promise we haven’t lost our marbles. . . .yet! 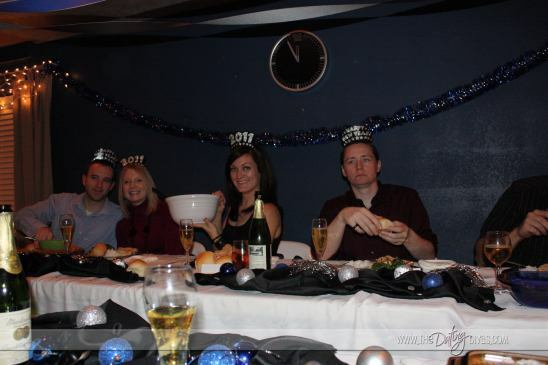 Since ten is my new midnight, I invited some friends over last year to ring in the new year. And we had a ball! #1- Invite the wackiest couples you know. . .
. . . .Er, *edited to say* The COOLEST couples you know. . .
That’s more like it! Um, not sure what happened with that first shot. . . 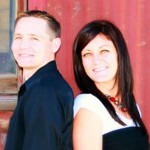 But these smiling faces are pretty much the coolest people I know, NUFF said! 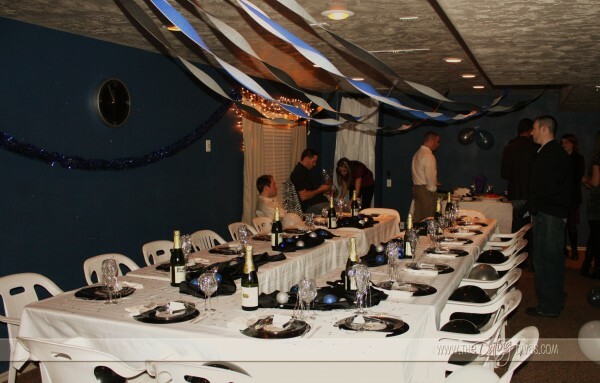 We decided on white, silver, blue & black for our color scheme. To keep costs to a minimal, we scrounged around our houses to find the best decorations for our event. . .and this was the result. 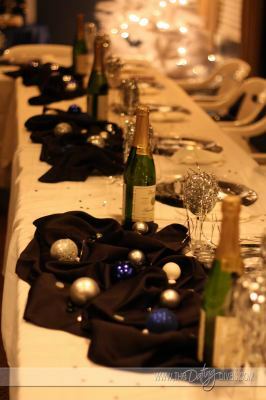 Colorful ornaments & confetti from the dollar store were the perfect touch to dress up the tables. The only thing we were missing was a “Happy New Year” banner. But hey, not too shabby for a bunch of wacky divas. And by wacky, I mean cool, of course! One of my favorite things was probably the simplest to do. 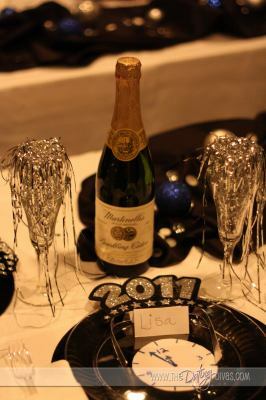 We stuffed and draped our fancy glasses with silver streamers (dollar store). It turned out pretty fancy, don’t you think?!! One of our games was the classic White Elephant. Being a Diva party there were a lot of desirable couple’s gifts in these packages! Relationship books, Date Night in a box, Bedroom gifts and lots more. (if I remember right, we won a pair of handcuffs!) Hands down the best White Elephant EVER! 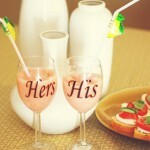 So if you need an idea for a White Elephant gift this year, than www.thedatingdivas.com has got you covered! 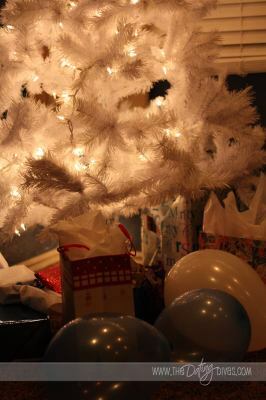 Just check out this Facebook update where readers recently shared their fabulous White Elephant ideas! Tara & her husband put together a pretty funny idea (inspired by one of our readers) this year that was a hit at the party they went to! The other game we played was called, “Loaded Questions.” We all came up with some witty questions beforehand, cut them apart, put them in a bowl, & passed them around the table during dinner. We aimed the questions at the husbands – putting them on the spot – with how much they know about their wives. You could play it the way we did it or make it more generic so each couple chose one question to answer about the other. Who do you secretly wish your wife would dress up as for Halloween? If you were stranded on an island together for ever and could bring 1 item with you, what would your wife bring? Who made the first move while you were dating? What is your wife’s greatest PET PEEVE? If your wife was allowed to have ONE last meal before heading off to the pearly gates….what would she choose? If you could take over ONE household chore for your wife forever….what would she want you to do? What makes your wife laugh really hard? What would embarrass your wife the most? What clothing/hair product/item could your wife NOT live without? What would your wife say the BEST date was that you two have been on? What is your wife’s favorite song? What pair of shoes best describes your gal? Tennis shoes, boots, heels, flats and why? What was your wife wearing on your first date? What was your wife’s first impression of you? How old was your wife when she had her first kiss? If your wife could be any age what would she be & why? You can easily change out the word “wife” with “spouse” if you wanted to go with the generic version. 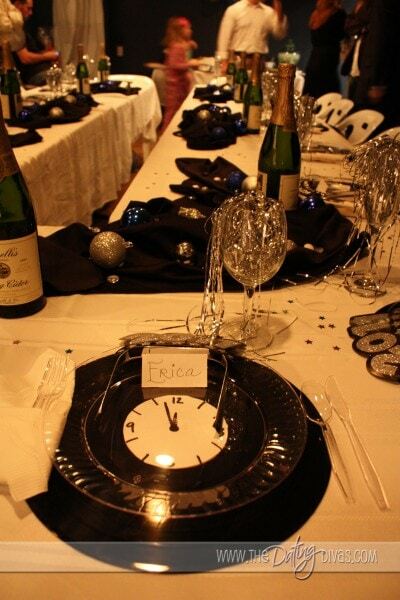 Kristen came up with this clever idea for our dinnerware! 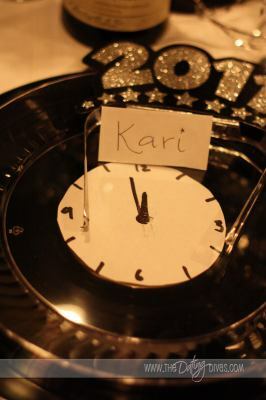 She took a sharpie to paper and created a clock that sat smack-dab in the middle of an actual record. YES, a record! She had a bunch left over from her Totally Awesome 80’s Prom Date that were just waiting to be reused. Then she topped it off by setting clear, disposable plates over them. Wa-lah! With the stage set, and everything complete there is only one last thing to do. 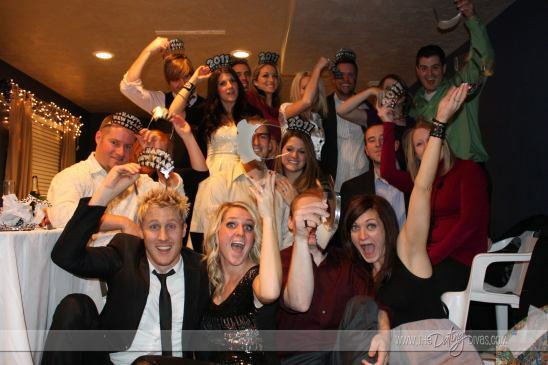 . . when that clock strikes Midnight. . .aka 10PM, ring in the New Year with your wacky…..I mean, cool friends! If you haven’t heard, New Year’s Eve is on a Saturday this year, which is the perfect day for a date night!! 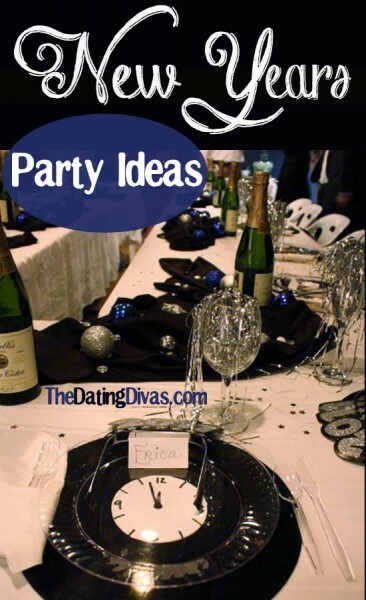 What are you waiting for, go plan your New Year’s Eve Party! 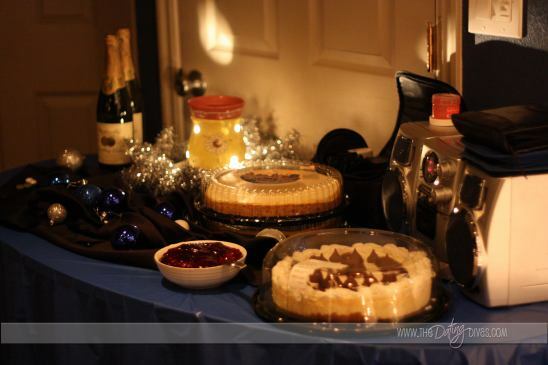 Celebrate the Holidays… Diva Style! Great ideas! This year, it’ll just be the wife and I will be bringing in the New Year (and maybe our four-month old, depending on when she decides to go to bed). I’m trying to come up with some stellar ideas to make her feel special. Thanks for all the tips you give on your site. OMG, that night was SO much fun! We definitely need to plan ANOTHER one 🙂 Miss all you girlies! That looks like a lot of fun! Y’all are so creative. Thanks for all the good ideas!